What Colors Do Miniature Schnauzers Come In? The American Kennel Club allows three colors to enter the show ring. Salt & Pepper, Black & Silver, and Solid black. No other colors are allowed in the show ring at this time. However the American Kennel Club does register other colors, these include: White, Liver (Chocolate), Black and White Parti, Liver and White Parti, Salt and Pepper Parti. These colors are registerable with the AKC but, you do have to send in pictures of your puppy to have them registered. What size do miniature schnauzers come in? The breed standard calls for the height at the withers or shoulder blades to be at least 12" and no more than 14". It does not specify any particular weight for the breed. The weight depends on there size and bone structure but, a dog measuring12" to 14" will typicaly be between 14 to 20 lbs. 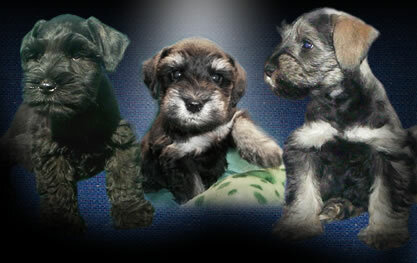 A lot of breeders are now breeding a “Toy” schnauzer. The toy schnauzer is not a separate breed, it is simply an undersized Miniature Schnauzer. They will be registered with the American Kennel Club as Miniatures even though they are under 12" tall. You can not show a toy schnauzer. If they are under 12 “ tall they will never be allowed to enter the show ring. We do have toy size schnauzers available from time to time. We do not specialize in toy size schnauzers. We specialize in the standard show size mini schnauzers. Our toy schnauzers have exceptional pedigrees along with looks and temperment they are just too small to enter the show ring. They make exceptional pets!